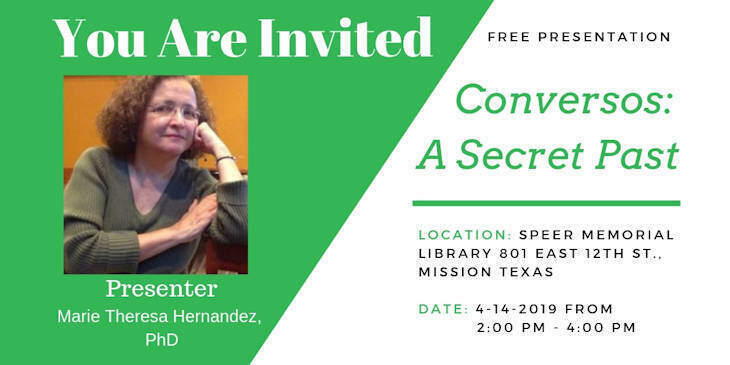 Come and listen to Maria Theresa Hernandez PhD presentation "Conversos: A Secret Past". For some families, identity contains a hidden surprise. One of the earliest groups of crypto-Jews, or conversos, was brought to North America by Luis de Carvajal y de la Cueva in the 16th century and populated northern Mexico and southern Texas. Some abandoned allegiance to Judaism, gradually losing knowledge of their Jewish identity. Others held on to their beliefs and traditions, making modifications in forms of worship. Discover how families are uncovering centuries of secrets and redefining their cultural and ethnic identity today. The presentation will be April 14 at 2:00 PM at the Speer Memorial Library located at 801 E. 12th St. in Mission Texas. There is no cost to attend and it is open to the public. We hope to see you there and will be glad if you can make it. You Can't Make it to this Presentation? Don't worry, join Las Villas del Norte today and you can watch this presentation online two days after it is recorded. You will also get our printed book "Las Villas del Norte, The 1757 Censuses of Laredo, Dolores, Revilla, Mier, Camargo, and Reynosa", the e-version of our latest Journal, plus a ton of other great resources to help you in your genealogy. Any questions, concerns, or suggestions please let us know bellow in the comment area of this post. Don't forget to join our mailing list using the box to your right hand side to get a recap of the presentation along with any important resources mentioned by our guest.